← Eric Hodgens. Catholic Culture Wars. ABUL RIZVI. Is the Government walking both sides of the street on immigration? Scott Morrison has announced (see here) a commitment to ‘create’ 1.25 million jobs over the next five years, beating Tony Abbott’s commitment in 2013 to create 1 million jobs over five years. But to achieve 1.25 million jobs over five years, Morrison will need to maintain an even higher level of net migration than over the past five years. How should we reconcile this with Morrison’s earlier speech committing to reduce immigration, particularly to reduce congestion in the major cities (see here)? Well the two can’t be reconciled. One of them must, almost by definition, be untrue. Tony Abbott (and Malcolm Turnbull and Scott Morrison ) did indeed ‘deliver’ 1 million jobs over five years (ABS Cat 6202). But 200,000 jobs per annum has been the average number created every year for at least the past 15 years, especially since the Howard Government steadily boosted immigration from 2001 and Morrison as Immigration Minister ‘locked in’ a migration program (ie permanent residence visas issued) at 190,000 per annum in the infamous 2014 Budget. 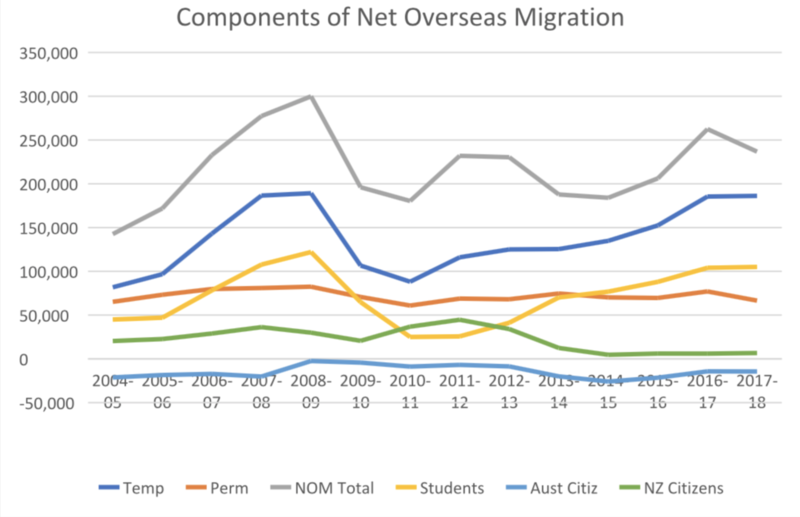 Achievement of Abbott’s commitment was particularly assisted in 2016-17 when the economy was performing strongly, job creation was strong, the participation rate increased and net migration (permanent and long-term arrivals minus permanent and long-term departures) surged from 206,230 in 2015-16 to 262,490 in 2016-17. While net migration fell back to 236,733 in 2017-18, over the past five years net migration has totalled 1,077,263, an average of 215,000 per annum (ABS Cat 3412). Morrison has for some time been promising to cut immigration and re-direct migrants to the bush. Assuming this is confirmed sometime before the election, who will then fill the extra 50,000 jobs per annum, noting that a significant portion of those who already have part-time jobs say they want to do more hours? If people doing part-time work were indeed given more hours, this would not add to the total number of jobs. Moreover, with a cut to immigration, what will make up for the negative impact on aggregate household consumption expenditure; the largest component of GDP, and a critical driver of job creation? With Australia’s labour participation rate (65.6 percent) and employment to population ratio (62.4 percent) at or near record highs (ABS Cat 6202), it is difficult to see the extra 50,000 workers per annum coming from an increase in either of these two ratios. This is especially the case as Australia has now moved into its demographic burden phase (ie working age to total population ratio is in decline and the portion of the population 65 and over is steadily rising). In countries that are much further down the ageing path than Australia (eg Japan and many European nations), participation rates and employment to population ratios have been falling for some time. We are also unlikely to see the rate of natural increase delivering the extra workers as all the relevant people who may get a job in the next five years have already been born. The long-term trend is for natural increase to decline rather than rise given Australia’s fertility rate is near a record low of around 1.75 babies per woman and the median age of our population is already over 37 and rising. The extra workers are also unlikely to come from a further decline in the unemployment rate as that it is currently at a relatively low 5 percent. While the Treasury assumptions of economic growth, wages and investment in the 2018 Budget were sufficiently heroic to result in a further fall in unemployment, the current consensus of businesses and economists is predicting slower rather than faster economic growth (see here). For Australia in particular, another concern is the slowing Chinese economy. From an immigration perspective, Morrison is under pressure from Tony Abbott to make much deeper cuts than even Peter Dutton was pursuing. Without a substantial rise in net migration and a much stronger economy, we can safely put Morrison’s commitment to ‘create’ 1.25 million jobs over the next five years in the ‘electioneering’ category. The Treasury assumptions supporting this rate of job creation would be fascinating if they exist. Morrison will be hoping no journalist asks any hard questions on this one and that Australian voters are all a bunch of mugs. 2 Responses to ABUL RIZVI. Is the Government walking both sides of the street on immigration? Is the government walking both sides of the street? Actually, not at all, Abul, sleep tight. Morrison, and his opponent Shorten, are fully committed to the indefinite continuation of high migration, scorning all recent voter polls of any reliability. Morrison claims he wants to keep the official migration program around 160,000, which is still extraordinarily high in historical terms. As per the graph, Net Migration, the important figure in the Budget, continues to sail along at or above 200,000. The growth lobby dismisses the lived experiences of ordinary Australians. Voters aren’t imagining stretched infrastructure and services, stalled real wages and severe housing unaffordability, heightened inequality, and urban congestion. Instead they’re offered the official narratives. Look at the ‘job creation’ and GDP numbers! The rejuvenating population! The vibrant city plans! Never mind if these ‘plans’ cram eight million into Sydney and Melbourne, nearly four million into Perth, by mid century. I have read your interesting blogs on Immigration and find them very important in explaining the intricacies of the immigration debate. By the way, I have written a paper recently that argues that Tourism also creates “congestion” and if Immigration should be curtailed to decrease congestion the government should also curtail tourism! Happy to send you a copy of my paper if you send me your email address.